This 24-carat gold leaf slides sells for more than $12,500. If the (gasp) public playground or plastic jungle gym just won't do for your child, you're in luck. 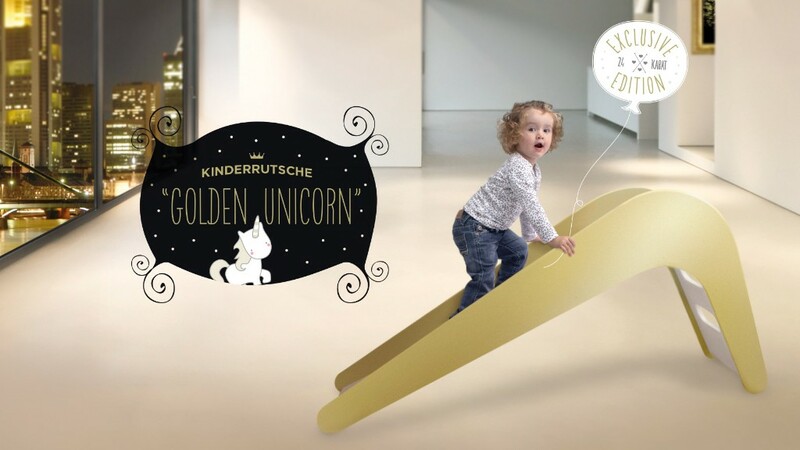 Jupiduu, a German start-up, just came out with a 24-carat gold leaf slide called the "Golden Unicorn" that can be yours for € 9,990, or more than $12,500. At about 57 inches long, that's nearly $220 per inch. So far, the company said it has already received four orders -- all of them from Dubai. But the five-figure blinged out toy wasn't enough for one customer, who requested a version embellished with ruby, according to Jupiduu's founder Kai Buschmann. The company wouldn't say how much this special ruby edition cost, but did say it was "definitely the most expensive children's slide in the world." The idea for the regal slide was inspired by -- who else -- Prince George. The company said it gifted its blue slide to the trend-setting heir to the British throne, and requests started rolling in from commoner parents. Buschmann said that customers from the Emirates asked if the slide was available in gold. With the high-end demand there, he started working with a local German company to gild its first model. If you're more into the basics, the company does still offer its slide in blue, pink, green and white for a less lofty price -- about $240 to $315, depending on the color.